The Ligyrotechnoling is a psychoacoustics-based Borderling. Its form is strangely skeletal. It resembles a skeleton of an elk or a deer. A green faint glow radiates from its body in an outline of a furry body. Where its head, or skull, should be, a floating blueish-green geometric shape takes its place. Each side will have a large red eye with white pupils. The common Ligyrotechnoling will have a shape of a translucent cube, a diamond, or a pyramid. Above the Borderling’s ‘head’ are a series of tubes that have an appearance of large antlers or branches. Black threads can be seen weaving around their skeletal form, each ending with a glass bulb. Larger Ligyrotechnolings will have a more complex head shape, more eyes on each side, and 48% more threads decorating their bodies. It cannot speak but it can communicate using parts of the music it imitates. The Borderling uses its horns to blow long, trailing notes. Its bones tap to imitate percussion instruments. An impure Ligyrotechnoling will have bones missing and will flicker in and out of existence. Because of its ailment, the Borderling is short-lived. The Ligyrotechnoling can be found in the wilderness next to any placid suburban area. Areas close to stadiums and there bands play are most likely to have a group of 4 to 8 of these Borderlings. Because of the cities’ boisterous activity, it is rare to find these Borderlings when a band is playing in the middle of a busy street. The Ligyrotechnoling enters our world through sound waves emitted from musical instruments. 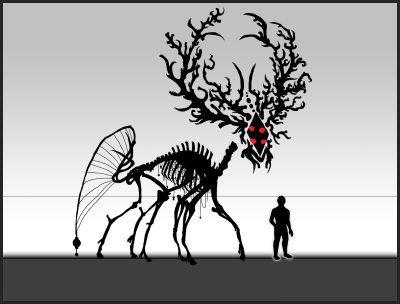 It will manifest into existence piece by piece, antlers first. Once after the head appears, the floating pile of bones will reassemble themselves from the bottom-up. Afterwards, the Borderling will wander from it's spawning location and follow any sources of sound. 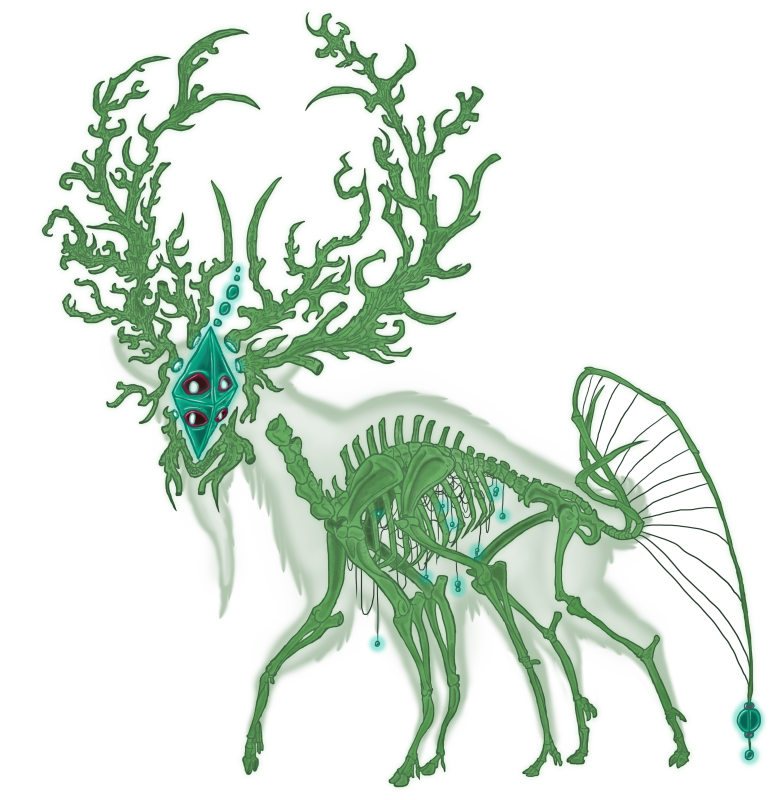 The Ligyrotechnolings will help one another get to and from the Externus through a loud, droning sound played by their antlers. When necessary, the Borderling will use this method to escape from harm when being trapped. The Ligyrotechnoling’s energy field and agility will help it survive for a short while until it returns back to its dimension. The Ligyrotechnoling, at first, has an unnerved disposition. Whenever it finds a person or a source of the sound, the Borderling becomes relaxed and feels comfortable. It walks with a slow and steady gait. The Borderling’s many eyes watch the ground below for any obstacles that may cause it harm. When it’s not in motion, the Ligyrotechnoling lifts its head upwards, observing its surroundings for any signs of interest. Its hollow antlers can pick up any faint sound, whenever it's a musical instrument or singing, the Borderling will immediately head toward the source of the sound. The Borderling will mimic the sound as accurately as possible when the object or person is within their eyesight. Their songs are not perfect imitations, 98% of the music they mimic will have pauses and stutters. When two or more Ligyrotechnoling meet and mimic the same music, their imitations will gradually deteriorate and loop within 2 hours. Once they no longer produce the sound, they will either nod their head in agreement or shake their head in disappointment. In a short while, they part ways. If the Ligyrotechnoling sees a potential threat, it will stop singing and run back into the wilderness, where the Borderling feels safe and secure. Its skeleton will collapse once their legs are broken. Death will soon follow, their glowing outline flickers and fades away. The Borderling respawns after 30 to 40 hours had passed. Within its short Effect Radius, the Ligyrotechnoling will distort any type of music and sound perceived by human beings. The longevity of the exposure will vary, depending on how long the individual stays within the Borderling’s effect radius. Short-term exposure will make an individual hear noises they are accustomed to in their daily lives. They hear the sound of their cellphone’s ringtone, but there are no ongoing calls. In over 4 hours, the person will hear nothing but jumbled noise being played repeatedly, getting louder within each minute. In a short while, the individual will lose their sanity. After treatment, the effects wear off after 8 days. When two or more Ligyrotechnolings meet, they cancel each other’s Effect Radius. It won’t affect people who are constantly producing any type of sound, whenever it's from music or from a conversation.